European Union nations are consuming wood, or “biomass,” to meet their obligations under the Paris climate agreement. In 2009, the European Union committed to a 20 percent renewable energy mandate by 2020, and allowed biomass sources to help make up that mandate. Several European countries (e.g., the United Kingdom and the Netherlands), subsidized the biomass industry, quickly creating a market for wood. The United States, Canada, and Eastern Europe supply the market by processing wood products into pellets and heat-drying them in kilns. 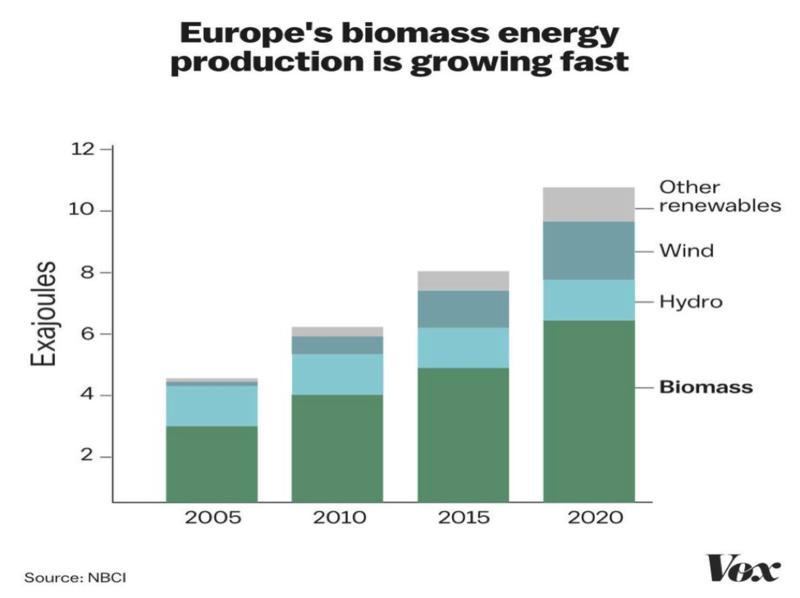 By 2014, biomass accounted for 40 percent of the European Union’s renewable energy—by far the largest source—and it is projected to make up 56 percent by 2020. 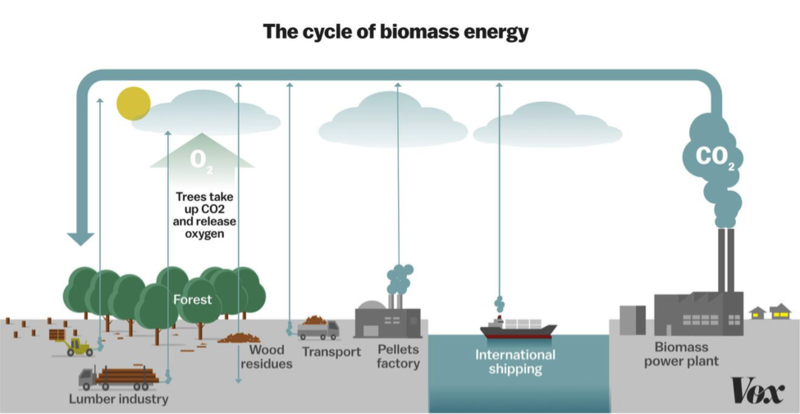 The concept is that biomass is both renewable and “carbon neutral” because burning wood releases carbon dioxide emissions, which are absorbed by existing and newly planted trees. But some scientists and policy activists believe that this notion is “deceptive accounting”. Rather than being carbon neutral, burning wood is consuming carbon stocks that can take decades to replace. Using wood to meet Paris commitments could be very challenging. For example, to meet just an increase of 3 percent in global energy demand with wood, the world would have to double its commercial logging. The Drax Group owns a power plant in the north of England that consumes nearly a quarter of global wood pellet production, about two-thirds of it from the United States. Drax powers 10 percent of the British electric grid, receiving about $1.2 billion a year in government subsidies. Drax burns wood in the UK’s former coal plants, which results in 80-percent savings in carbon dioxide when compared to coal. The wood pellet industry believes in the concept of carbon neutrality, i.e. the carbon burned in the pellets can be replaced by new trees and that the wood burned is industrial waste that would be lost anyway. The American lumber industry agrees, indicating that the pellet market provides a market for wood that would be cut anyway and would otherwise be left to slowly decompose or be burned as waste. It argues that coal is being replaced in power plants with a fuel source that can be regrown. Besides using waste, the lumber industry also clear cuts, which is the traditional method of harvesting a forest to get regrowth to come back, clearing dead wood that would otherwise slow the growth of a forest. When power plant owners burn wood pellets that were once living trees, they take on a large debt of carbon by liquidating an existing carbon credit. The concept is that there is an opportunity cost from what would have happened had that tree remained growing and pulling more carbon from the air. The system reaches parity when the components balance and how long that takes depends on how trees are cleared, what trees replace them, and what fossil fuel they replace, along with growth rates of species in different geographic areas. A lab at MIT estimated that parity takes between 60 and 90 years if the biomass replaces coal. The European Academy of Sciences is far less optimistic, estimating that parity is achieved in generations or centuries if biomass replaces coal and centuries if biomass replaces natural gas. It estimates that the carbon debt of a wind turbine is paid off in about a year. Drax, however, argues that it would take a maximum of 30 years to repay the carbon debt from the forests from which it obtains its wood pellets. A lawsuit was filed recently at the Court of Justice seeking to stop the European Union from counting wood as a renewable energy source. 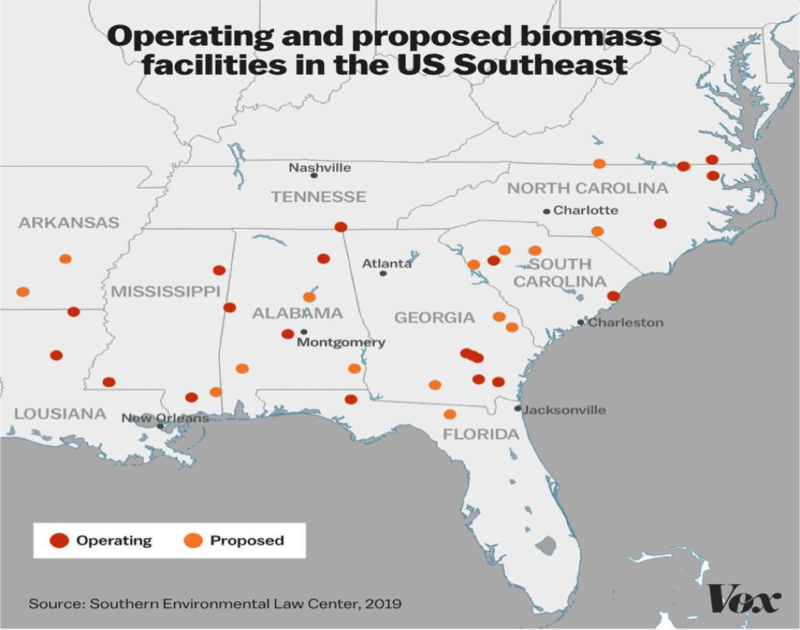 In the suit, plaintiffs from six European countries and the United States argue that burning biomass for heat and power is a false solution to climate change. The European Union Renewable Energy Directive promotes logging of ancient forests, “contravening the bloc’s higher principles and individuals’ rights,” they argue. The plaintiffs will also raise concerns about damage to biodiversity, cultural heritage, and human health in their regions. These range from the deterioration of peat bogs in Ireland to threats to Estonia’s pagan religious traditions. The suit challenges the European Union’s ability to get 32 percent of its energy from renewable sources by 2030. Nearly two-thirds of its renewables come from various forms of bioenergy, with more projects being planned. Carbon accounting of forest management has long been fraught with controversy, as scientists warn that it does not reflect the true climate impact. They believe that trees should be allowed to mature and store carbon instead of being harvested. The European Union, on the other hand, intends to partially meet its commitment to the Paris agreement by using all forms of biomass, including wood pellets.